Starting with Franklin Fischer in 1937, our family has assisted others in their greatest time of need through four generations. Our current staff has four licensed Funeral Directors and Embalmers who are dedicated to providing the compassion and respect that our clients have come to expect. Meeting and exceeding the needs of the families we serve is always our top priority. "Serving Others As We Would Like To Be Served." Gary Lynn Fischer, born in 1955, son of Patricia A Fischer Lewis and the late Lynn Ray Fischer, is a 1973 graduate of River View High School, attended the Muskingum Area Technical College and the Ohio University Zanesville from 1975-1977, and graduated from the Cincinnati College of Mortuary Science in 1978. He served on the Warsaw Village Council from 1984-1995, including two terms as its president. Gary has also been the Mayor of Warsaw, holding office from 1995 to 2006, and he is currently serving his third term as a Coshocton County Commissioner. Some of his other memberships include the Valley View Cemetery Board, River View Park Board, Warsaw Business Association, Warsaw Lion's Club, the Coshocton County Farm Bureau, River View Schools Foundation Board, and the Coshocton County Chamber of Commerce. He also attends Gospel Hill Ministry. He has three sons, Corey, Jesse, and Evan Fischer, and 9 grandchildren. He resides at the Warsaw Funeral Home with his wife, Michelle (Pew) Fischer, and step-son Zachary Elson. Nicholas Scott Fischer, born in 1959, to Patricia Fischer-Lewis and the late Lynn Ray Fischer, is a 1977 graduate of River View High School, attended the Ohio University Zanesville from 1978-1980, and graduated from the Cincinnati College of Mortuary Science in 1981 with an Associate's degree in Mortuary Science. Nick is a member and past President of the Warsaw Lions Club, past President of the River View Park Board, a past-member and past-President of the Coshocton County 4-H Endowment Committee, a past president and current member of the Ohio River Valley Llama Association, a lifetime member of the Llama Futurity Association, attend the First Church of the Nazarene in Coshocton, and owner of Village Llamas. He has two sons, Adam Fischer of Warsaw, and Jordan Fischer (deceased). He and his wife Patricia (Frazee) Fischer live in Warsaw. Corey Lynn Fischer, born in Coshocton in 1976, son of Gary Lynn Fischer and Vicki (Meek) Harper, is a 1995 graduate of River View High School. He graduated from the Ohio State University in 2000 with an Associate's degree in Fine and Applied Arts, and from the Cincinnati College of Mortuary Science in 2001 with a Bachelor's degree in Mortuary Science. He completed his apprenticeship and became a licensed Funeral Director / Embalmer in 2003. He is a Councilman for the Village of Warsaw, a long time member, and current Vice President, of the River View Park Board, a member of the River View Schools Foundation Board, and attends Gospel Hill Ministry. He is also an avid bow hunter, and a lifelong Buckeyes, Reds, and Bengals fan. After living in the Danville funeral home for over ten years, he now resides in Warsaw with his wife Chrissie (Hobbs) Fischer, their two sons, Caleb Lynn and Brody Nathaniel, and daughter, Ally Marie. Jesse Matthew Fischer, born in Coshocton in 1979, son of Gary Lynn Fischer and Vicki (Meek) Harper, is a 1998 graduate of River View High School, graduated from the Ohio State University in 2001 with an Associate's degree, and from the Cincinnati College of Mortuary Science in 2002 with a Bachelor's degree in Mortuary Science. Jesse completed his apprenticeship and became a licensed Funeral Director / Embalmer in 2004. He is currently serving as a member of the Warsaw Village Council. He is a member and past-President of the Warsaw Lions Club, as well as Chairman of the Lions Sight Committee; the River View Park Board, currently serving as President; the Coshocton Regional Medical Center Advisory Board; the Community Hospice Board of Trustees; and past-President and member of the Executive Board of the Coshocton County Chamber of Commerce. He and his wife, Tana M. (Ford) Fischer, and three sons, Logan Ray, Jake Robert, and Alex Matthew reside in Warsaw. Patricia Ann (Kanuckel) Fischer-Lewis, born in 1939, daughter of Harve W. and Erma (Reed) Kanuckel, married Lynn Ray Fischer in December 1954. 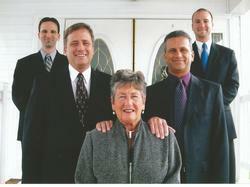 Patricia and Lynn had two sons, Gary and Nicholas both now Funeral Directors. Lynn and Patricia purchased the Fischer Funeral Home in Warsaw from Franklin J. Fischer in 1973. Lynn added the Danville location in December of 1979. Lynn Fischer died in January of 1985. She married Jack E. Lewis in February of 1990, who died in March of 2009. She is a member of the Warsaw United Methodist Church and currently resides next door to the Funeral Home in Warsaw.